There’s a finish nailer for just about any job a woodworker will encounter. Here’s our A to Z guide of manufacturers and the current offerings. There are more than 40 brands of finish nailers on the market, and most manufacturers offer several models. But choosing between literally hundreds of options isn’t as daunting as it sounds. That’s because there’s more than one right answer here. These aren’t very complicated machines, so almost any of them will deliver decent quality and handle the job. And as tools go they are relatively inexpensive, so this isn’t a major investment. However, choosing the right tool, or family of tools, based on weight and ergonomics can help shorten a long day on the job. Most guns will shoot more than one length of nail, and sometimes both nails and staples, so that may be a consideration. And many of the better models have mechanical advantages that stop marring, or can reach into small spaces, or make quick work of dislodging a jam. The differences between models – even in the same branded family – are often subtle, so woodworkers shopping for a new gun will probably be more concerned at first with the nails rather than the guns. 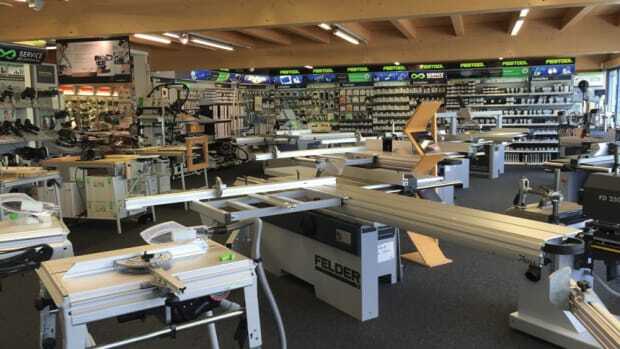 The term ‘finish nailer’ most properly refers to guns that drive trim nails, but in reality most woodworkers now use the term generically to include three families of fasteners: finish, brad and pin. Pins are very small headless nails with 21- or 23-gauge wire shafts, and they come in lengths from about 3/8” to 2” with most being on the shorter side. Brads are a little thicker at 18-gauge, and they have flats heads that are small enough that they don’t always need to have the divot filled. They come in a range of lengths from about 5/8” to 2”. The last category, finish nails, are quite a bit thicker at 15- and 16-gauge, and these run from about 1” to 4” long and will always need to have the divot filled on appearance surfaces. 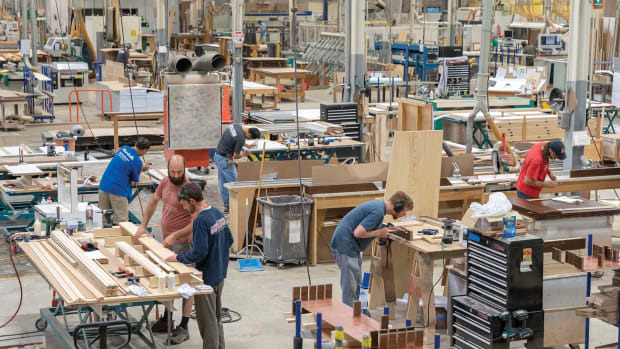 The biggest choice for woodworkers is which of the three to buy, and the best answer is all three. You’re going to use them, and they’re affordable. Pins are great for installing small items such as embossed carvings, or holding miters together until the adhesive cures. Brads have a little more holding power and are used on jobs such as small moldings, attaching solid hardwood edging to panels, or perhaps securing cove in muntins. And finish nails are ideal for base, case and crown installs. 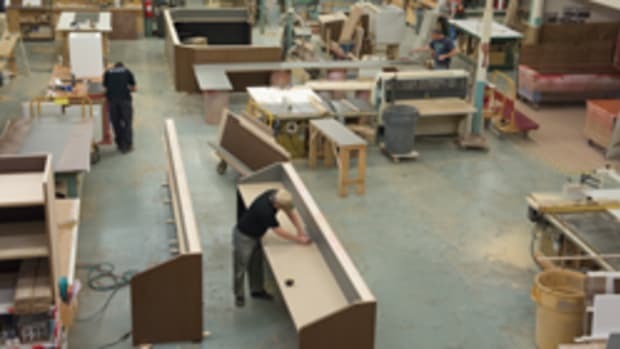 Plastic composite brads and nails are also ideal for securing work to a spoil-board on a CNC as they can be milled without damaging bits and blades. And their severed shafts are so small and stainable or paintable, they virtually disappear in most woods. Straight guns are perhaps the easiest to use on flat surfaces, while angled guns can reach into corners and tight spots. The following list flows through the manufacturers alphabetically, pausing when something new or interesting pops up. It is presented this way so that you can quickly locate various brands, see what’s new, and quickly find the company’s website. Saddle Brook, N.J. is home to Arrow Fastener Co. LLC. 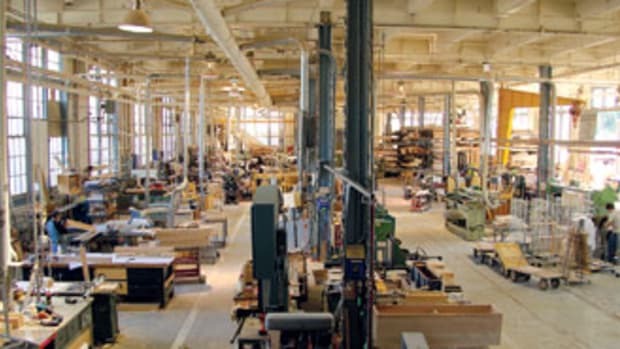 (arrowfastener.com), a familiar name to generations of woodworkers. Arrow is part of Masco Corp., which is headquartered in Livonia, Mich., and it makes seven guns for brad nails (six electric and one pneumatic, the PT18G), one for angled finish nails (PT15G), and one for pins (PT23G). 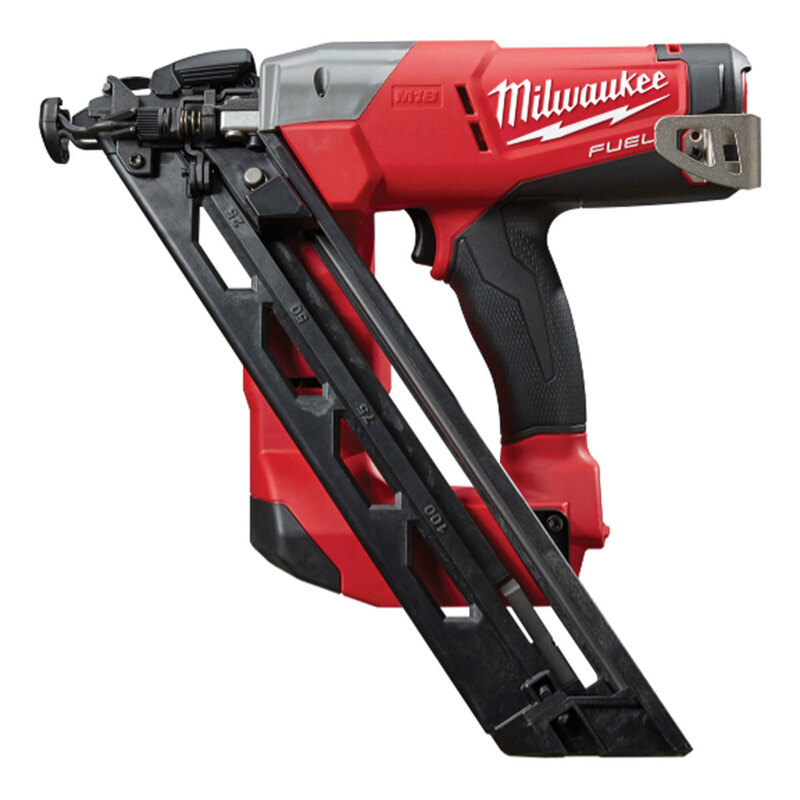 An electric finish nailer is an especially appealing option for installers who don’t want to lug a compressor or tank to a jobsite, or have clients endure the noise one makes. BN Products (bnproducts.com) makes a line of economy nail guns under the Aeropro-USA brand. Included are a pin, brad and finish nailer, plus an interesting tool called the SF5040RN 2-in-1 combination nailer. It’s a very inexpensive (under $70) pneumatic gun that runs both 3/4” to 2” brads and 18-gauge 1/4” crown staples. 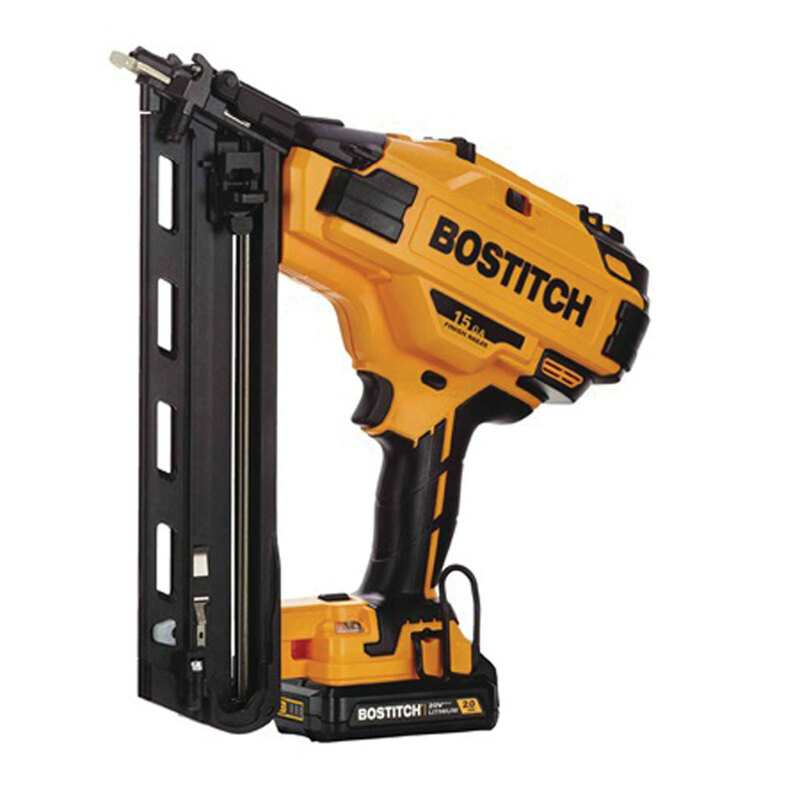 Bostitch (bostitch.com) has a line-up of 15 finish and brad nailers, three of which are powered by cordless batteries (20-volt Li-ion and no gas cylinders). Those are a brad nailer, a 15-gauge angled finish nailer and a 16-gauage straight version. 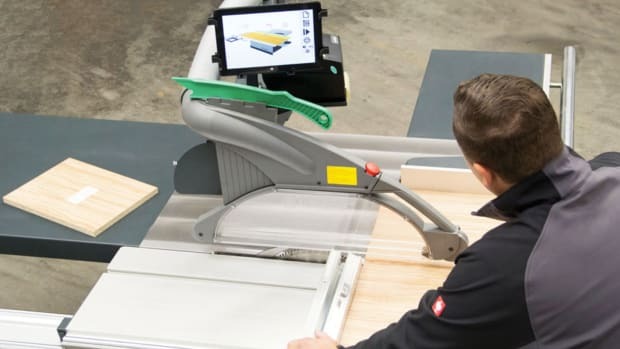 Bostitch’s Smart Point nailers feature small noses that “eliminate the need to compress the contact trip to actuate the tool, reducing work surface damage and the risk of pushing the material out of position,” according to the company. Cadex (cadextools.com) offers two 18-gauge brad guns, two 21-gauge pinners (with a nail range of 1/2” to 2-3/16”), and eight 23-gauge pinners. They all have a built-in dust blower, so a woodworker can see where he/she is aiming. 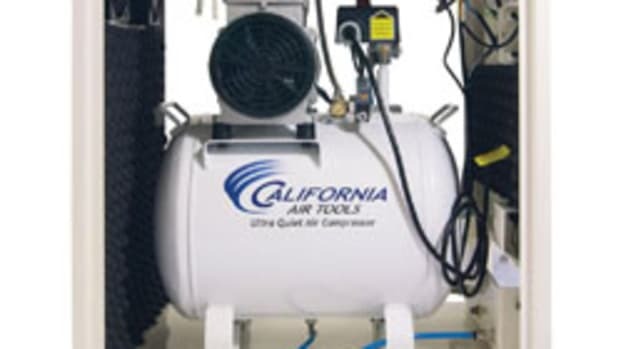 Campbell Hausfeld (campbellhausfeld.com) offers everything from compressors to air tools. Among them is the 1-1/4” nailer/stapler (CHG00189AV), which has a 2-in-1 magazine that drives both 18-gauge brad nails and 1/4” crown staples. Other sizes are available that drive longer nails and staples. Crisp-Air Tools (crispocanada.com) is a Toronto company that offers both consumer and professional grade guns. Pro models include the 18- gauge (5/8” to 2”) and 16-gauge (3/4” to 2-1/2”) brad nailers, both of which have a quick-release nose and a low nail indicator. 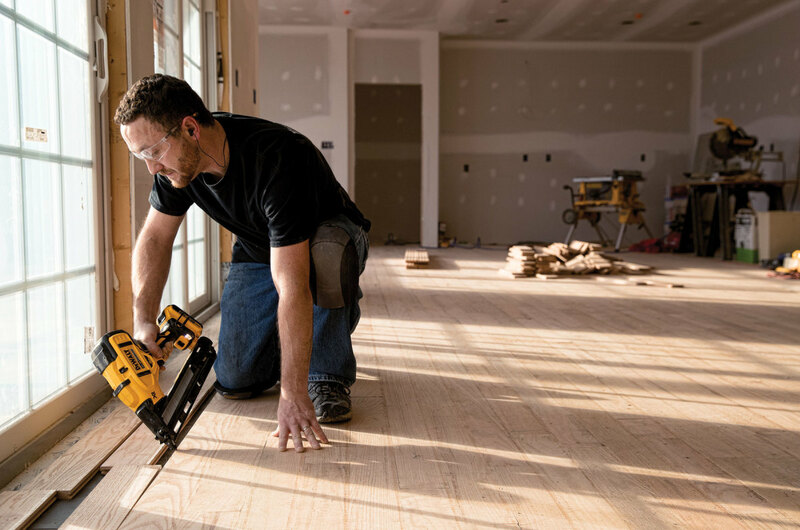 DeWalt (dewalt.com) offers several cordless and pneumatic options in small nail guns. 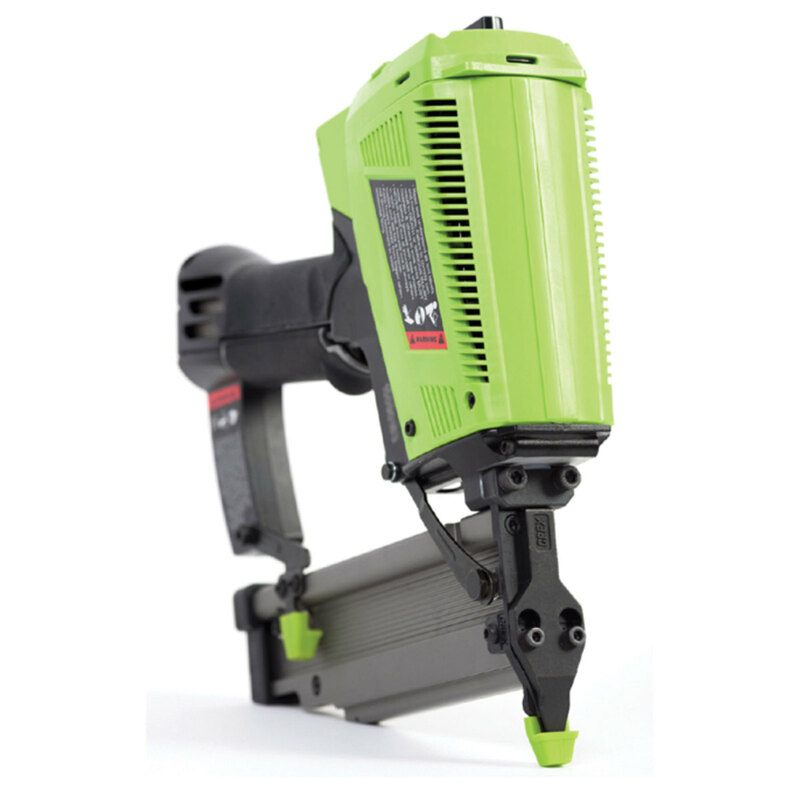 Among them is the DCN650B, a 15-gauge angled finish nailer that drives fasteners from 1-1/4” to 2-1/2”. It has a brushless motor powered by a 20-volt Li-ion battery so it doesn’t need gas, a compressor or a hose. Other cordless models include a brad gun and a pinner, plus a 15-gauge Precision Point finish nailer that has a built-in gauge that flips out to measure exactly 16” from end to nose for convenient location of studs when installing wall trim. Everwin Pneumatic Corp. (everwinpneumatic.com) was founded by a group of American and Taiwanese pneumatic tool experts in 2012, and the Taiwan-based factory makes four pin nailers, the P635 (23-gauge), P650 (23-gauge), P850 (21-gauge) and the P650D (23-gauge). They have dry fire lockout with an over-ride system to prevent driver marks on a workpiece. 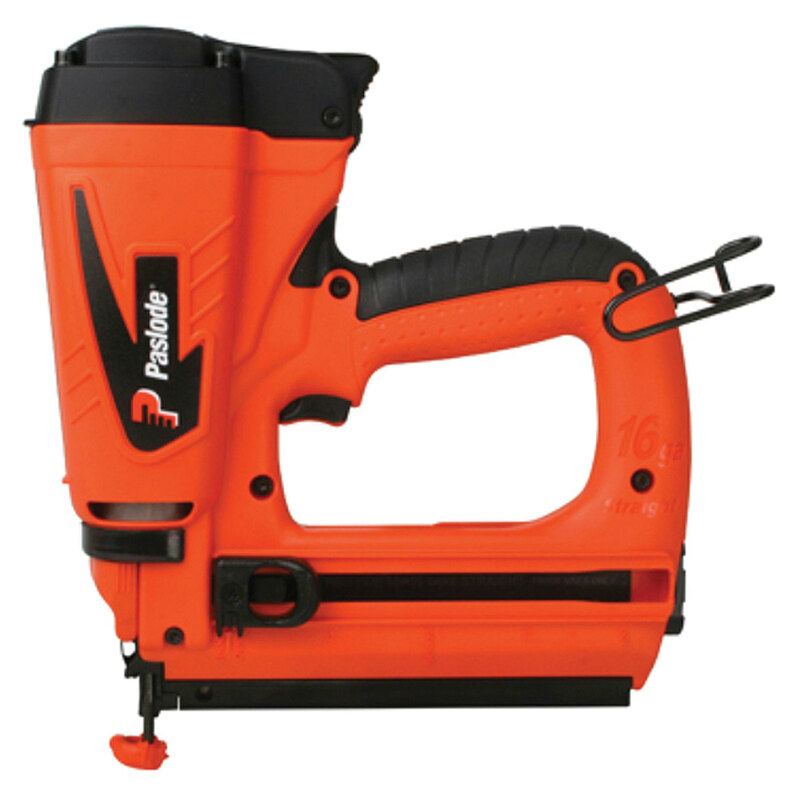 Fasco America (fascoamerica.com) makes two 23-gauge and one 21- gauge pinner, six 18-gauge bradders and a 16-gauge finish nailer. Both the F23 A64-35PB and F23C A64-50PB will fire the company’s A64 pins (23-gauge) and Micro brads (23-gauge) The 16-gauge F3C FN-50A nailer is suited for hardwood applications with a driver threaded into the piston for better resistance. It handles nails from 5/8” to 2”. Freeman Tools America (freemantools.com) makes a 16-gauge straight finish nailer and a 34-degree angled 15-gauge gun. The latter has a tool-less nose that makes it easy to clear jams, and a selective actuation switch that flips from sequential to contact fastening. The company has four pneumatic brad nailers (two of which have the quick jam release), and a 23-gauge pinner. Grex (grexusa.com) presents the new GC1850 2” 18-gauge cordless brad nailer and four award-winning 23-gauge pinners, two (P645L & P650L) of which alert the user when it’s time to reload. Grex also makes 15-, 16- and 21-guage models. Grip-Rite is a trademark of PrimeSource Building Products and has five offerings in the finish nailer field. 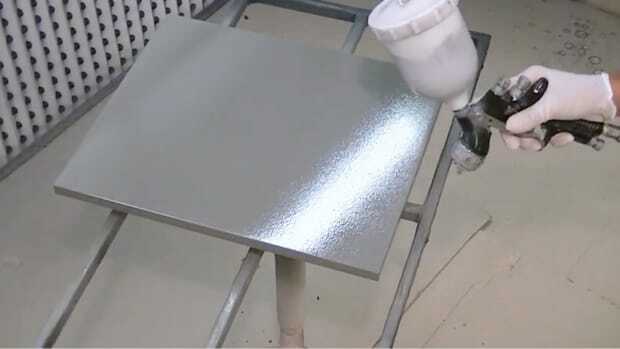 There’s a 23-gauge pinner, two brad guns and two nailers – a straight 16-gauge and an angled 15- gauge, for which the company also makes stainless steel nails. The Home Depot offers a set of four hobbyist HDX brand finish guns for $149 (as of 9/5/17). Included are a pinner, bradder and straight finish nailer, and an 18-gauge narrow (7/32”) crown stapler. 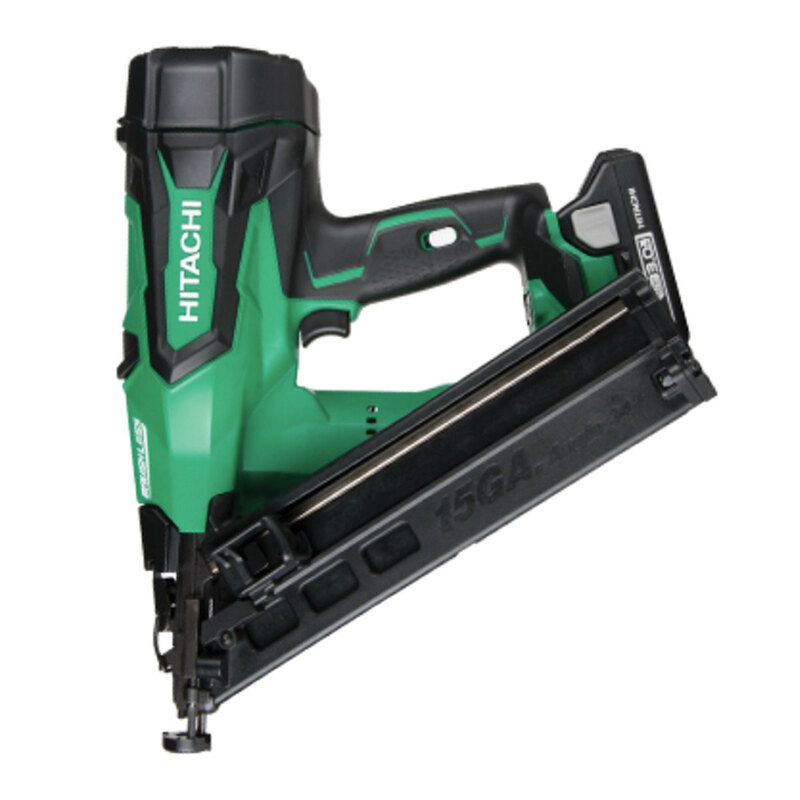 Hitachi (hitachipowertools.com) has a comprehensive line-up that includes an angled and a straight pneumatic finish nailer that have built-in dusters, plus both straight and angled gas-powered nailers and bradders for remote jobsites. There are also 15-, 16- and 18-gauge cordless nailers in the catalog, each powered by a brushless Li-ion 18-volt pack. They have a selective actuation switch that transitions between sequential mode and bump fire mode when rapid nailing is needed, and a built-in LED light. Husky (huskyoutdoortools.com) is another budget brand offered by The Home Depot and it includes three brad nailers and two finish nailers. Interchange Brands LLC (interchangebrands.com) makes a composite and a metal body brad nailer, plus a straight 16- and an angled 15-gauge finish nailer, and a 23-gauge pinner. The composite tool (NB3518C) is only 1.64 lbs. and it drives 18-gauge brads from 1/2” to 1-3/8” long. The Iron Horse brand includes the IH-AFN34, which is a 34-degree, 16-gauge, 2-1/2” angled finish nailer that shoots 1-1/4” through 2-1/2” nails. There are a couple of other economy guns in the line, which is distributed through The Home Depot and some online suppliers. 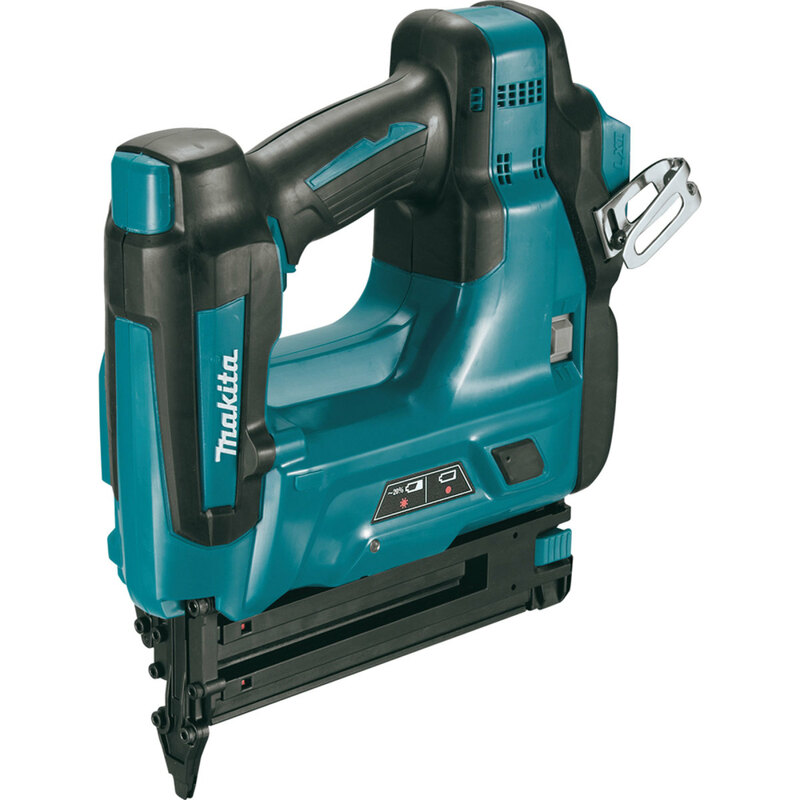 Makita (makitatools.com) has developed an extensive line of pneumatic guns that includes a pinner, a bradder and two finish nailers, one of which is angled. The company’s 18-volt Li-ion cordless line has a couple of 23-gauge pinners and an 18-gauge brad nailer (model XNB01Z) that looks positively futuristic. It drives nails from 5/8” to 2”, and up to 1,000 nails on a single charge, according to the company. Max USA Corp. (maxusacorp.com) offers two angled and two flat finish nailers, a pinner and three brad guns. The lightweight and slim NF665A/15 angled nailer can be contact or single fired with a switch lever, and it has a dial depth control that requires no special tools. Exhaust air can be diverted away from the user without tools, and the gun holds 106 nails. NextWay has a line of pneumatic tools under the 3 Pro brand name, and publishes a catalog online at 3-pro.com. It offers two brad nailers that handle lengths from 3/8” to 1-1/4” and 3/4” to 2”, respectively. There’s a 15-gauge angled gun (model DA1564P) that has a quick jam release and accommodates nails from 1-1/4” to 2-1/2”, and a couple of 18-gauge combination guns that will handle both nails and 1/4” crown staples. NuMax (numaxtools.com), which shares premises with Freeman in Ball Ground, Ga., has six finishing guns. Two of them are 3-in-1 models – they shoot 16-gauge nails, 18-gauge brads and 18-gauge 1/4” staples. And the S2-118G2 is a 2-in-1 brad nailer and stapler that delivers 3/8” to 2” nails and 1/2” to 1-5/8” staples. Omer USA (omertools.com) makes guns that fire Raptor composite plastic fasteners (raptornails.com). 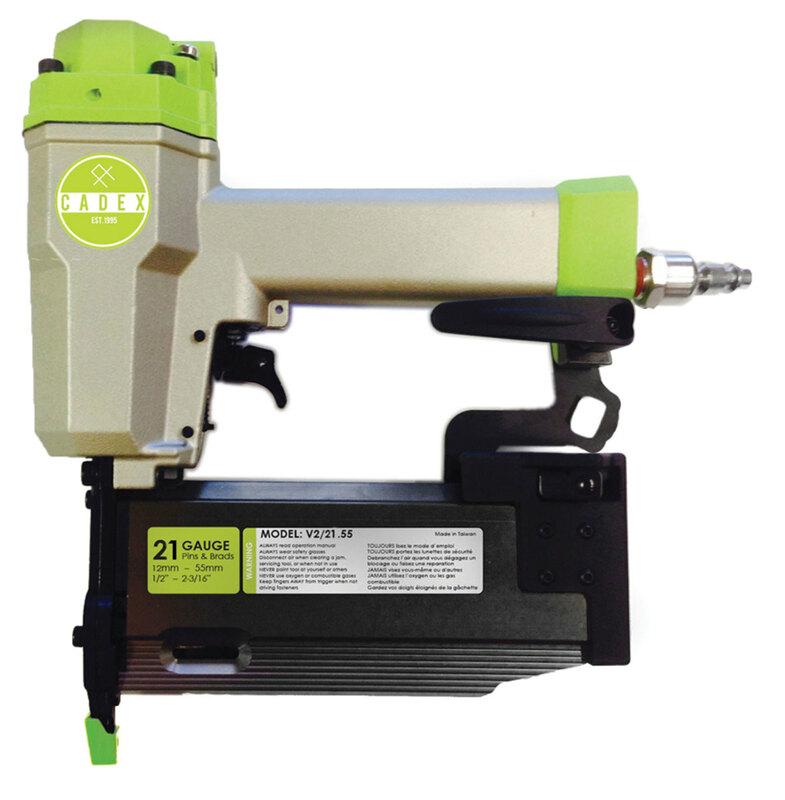 The Omer B17P.763 finish nailer drives Raptor 15- and 14-gauge plastic nails in the following lengths: 1/2”, 5/8”, 3/4”, 1”, 1-1/4”, 1-1/2”, 2” and 2-1/4”. Plastic composite nails have many uses in exterior trim and boatbuilding, where they don’t rust; in jig and fixture making, where they won’t damage bits or cutters; and in temporary glue or clamp use, where they have remarkable vertical strength yet can be snapped with a gentle sideways force to release parts. Paslode (paslode.com) has been building gas/battery powered framing and finishing guns since before the Li-ion revolution, and was the go-to gun on remote sites for many years. Paslode has just introduced two new tools, a 16-gauge straight nailer and an 18-gauge brad nailer. Both are Liion powered, and the larger gun (model IM250S-Li) weighs only 4.6 lbs. 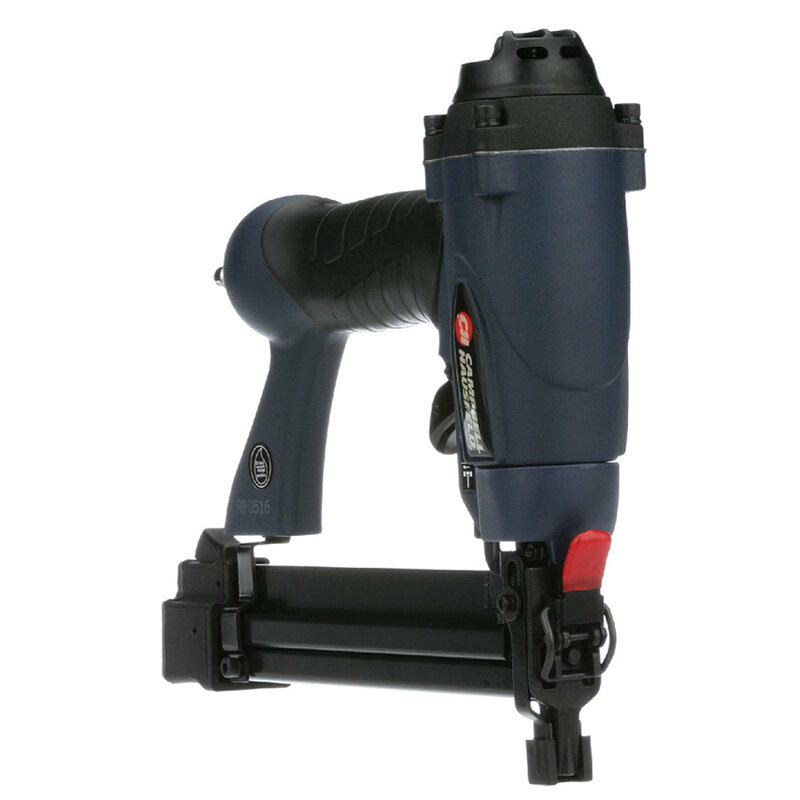 Performance Tool (performancetool.com) makes a 3-in-1 air nailer (model M673) that can drive brads, staples and finish nails. 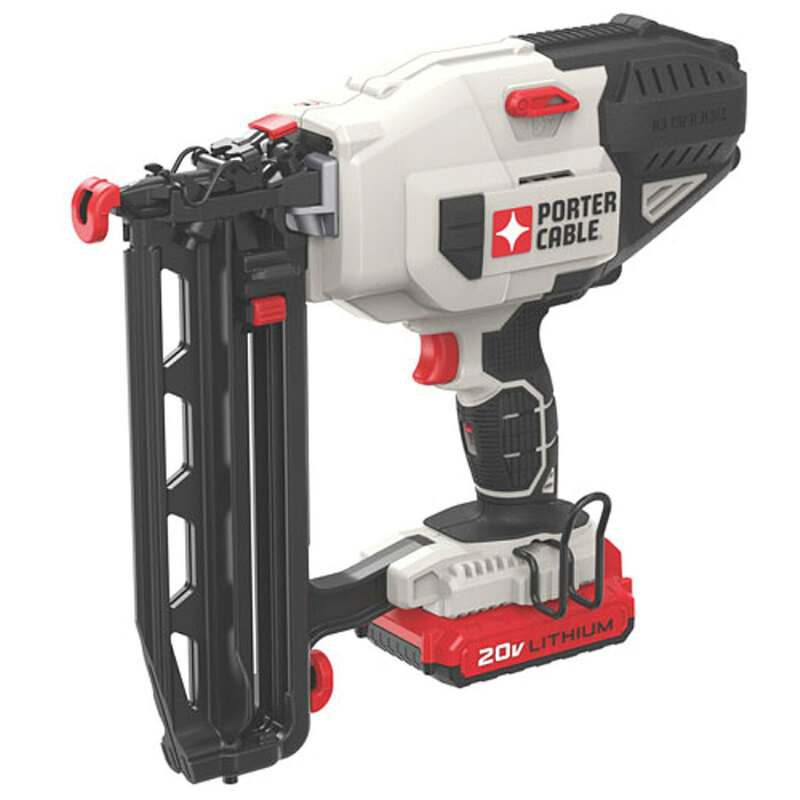 Porter-Cable (portercable.com) offers about a dozen finish nailers in both pneumatic and battery options. The 20-volt PCC792B is a Li-ion powered 16-gauge gun with a built-in LED worklight, tool-free jam clearing and depth setting, sequential firing mode and a trigger lockoff. It fires 1” to 2-1/2” nails, and weighs in at 6.5 lbs. A brad gun is also available with the 20-volt power pack, and both can come as a kit. Powermate has an 18-gauge nailer/stapler kit (model 024-0179CT) that has a tool-free adjustable exhaust, and a low nail/stapler indicator window in the magazine. It shoots 5/8” and 1” staples, plus 1” and 1-1/4” brad nails. A Coleman branded version is available from Sportsman’s Guide (sportsmansguide.com). PowRyte (powryte.com) distributes through The Home Depot, Walmart, Sears, Lowes and Tool King, as well as some online shopping sites. 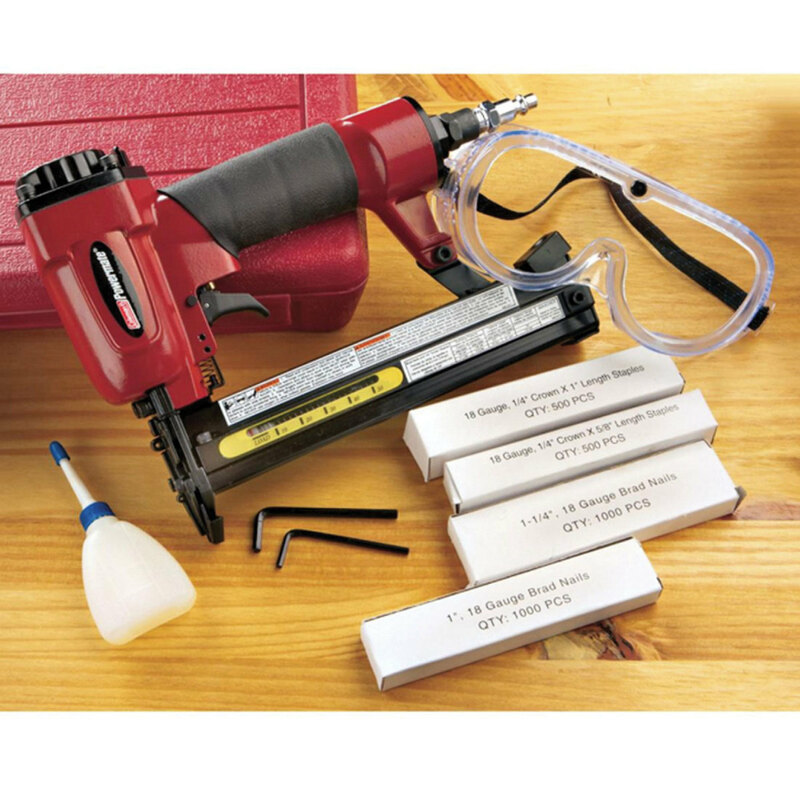 The company offers a brad nailer/stapler, a pin nailer, and a straight 16-gauge finish nailer (model 1001910) that handles nails from 3/4” to 2” and has a split nose design for quick jam fixes. Prona Tools (pronatools.com) makes a 16-gauge finish nailer (model B16/50-C1), and some brad guns. 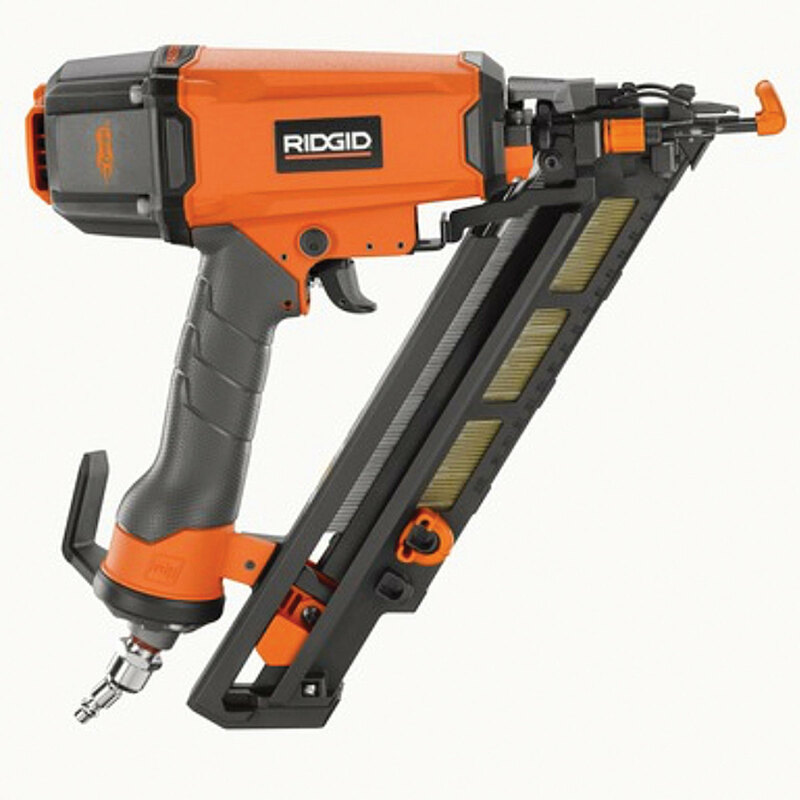 Ridgid (ridgid.com) is a division of the multi-national Emerson corporation and distributes through Grainger, Ferguson, Total Tool and other retailers. The company offers a brad nailer, and both angled and straight finish nailers. The 2-1/2” angled tool (model R250AFE) is 15-gauge and has all the bells and whistles – oil-less motor, dry-fire lockout, tool-free jam fixing, adjustable exhaust with muffler, and an Accu-Drive tip design that helps with accuracy. Ryobi Power Tools (ryobitools.com) are sold exclusively through The Home Depot. Among its 18-volt tools are an 18-gauge brad nailer, 16- gauge straight finish nailer and 15-gauge angled finish nailer (model P330). The latter weighs 6.8 lbs. 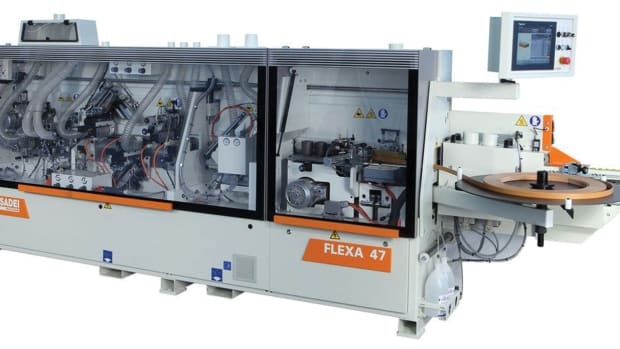 and has the capacity to drive up to 750 nails per charge (1” to 2-1/2”) using the P108 battery, which is sold separately, according to the company. Senco (senco.com) offers a wide array of both pneumatic and cordless guns. Among its newest offerings are composite (plastic) fasteners and the guns that fire them. 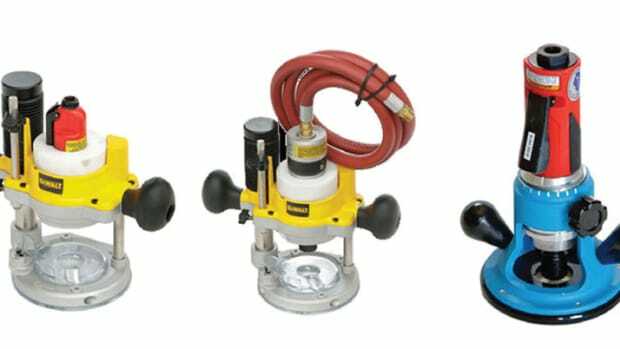 Manufactured with a blend of polymer resin and fiberglass, these fasteners can be machined without damage to router bits, cutting blades, or sanding belts. They require dedicated pneumatic tools, and in addition to composite staplers, the company offers an 18-gauge brad gun and a 15-gauge finish nailer, the SPFN15XP. This latter comes with a reversible belt hook, rear exhaust with an embedded muffler and an ultra-narrow nose that allows easy access to tight spaces. The plastic nails are 3/4” to 1-1/2” long. Surebonder (surebonder.com) offers a budget-minded brad stapler with directional exhaust and a nail viewer, plus a straight finish nailer (9755) that also has a quick release nosepiece for fast jam clearing. And finally, WEN (wenproducts.com) makes an 18-gauge brad nailer that sells for $45. The model 61720 gun drives 3/4” to 2” brads and has a lightweight aluminum body and a quick-release design that makes jam clearing easy. The kit includes oil, adjustment wrenches and a carrying case.